Nothing is harder to reinvent than the archetypal lace wedding gown, but this is the challenge I gave myself with Mariana. 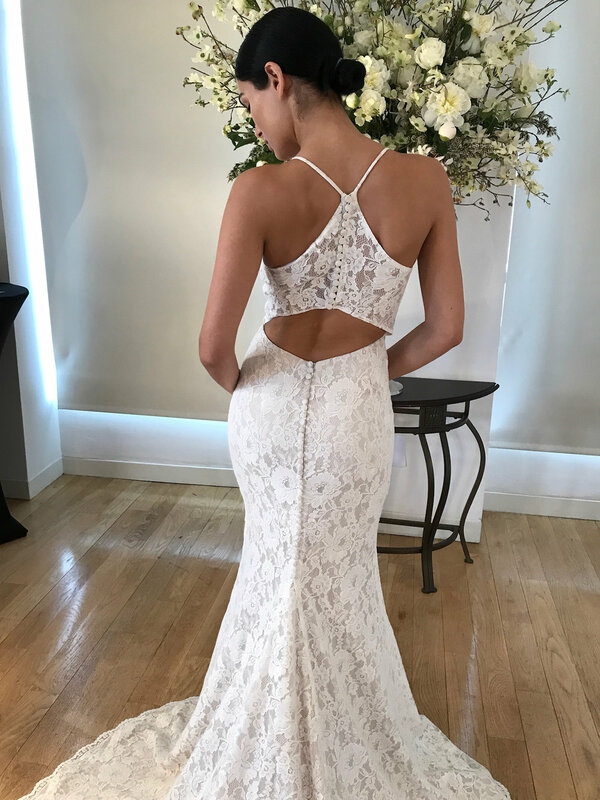 She is a classic lace fit-to-flare gown that almost feels old fashioned until you see her stunning back. For Mariana, I chose a soft, matte Chantilly lace with a pretty rose motif and paired it with a champagne underlay to emphasize the feminine and flirty details within the lace. For brides who desire a more demure look, Mariana is also available with an ivory underlay. The plunging V-neckline is shaped to elongate the torso and flatter busts of all shapes and sizes. The sheer lace illusion back shows just enough skin without being shocking, and the curves of the back neckline were meticulously tweaked over and over for the perfect delicate and feminine effect. Every detail counts, and finishing touches such as the lace-covered buttons along the back and the scallop lace hemline extends the romance.